Intense colour, intoxicating fragrance and a sumptuous display; what isn’t to love about rich pink Oriental lilies? This sheaf style bouquet is a showstopper and is our recommendation if you’re looking to send something truly extravagant. 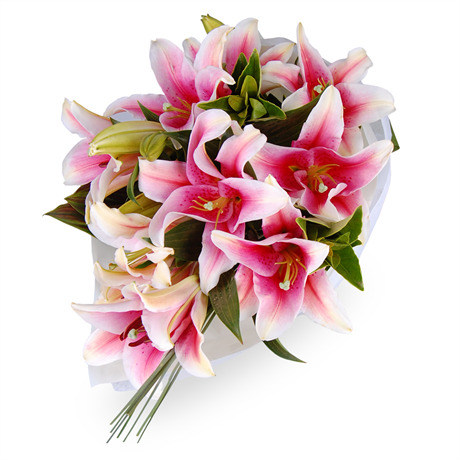 The Gina is an impressive selection of Oriental lilies set against greenery. This makes an imaginative romantic gift for the girl who loves pink, the perfect present for someone with an appreciation for tropical blooms, or a fantastic ‘thinking of you’ gift. It’s easy to show someone how special they are with this spectacular vision of pink. This bouquet does not come in a vase, however we recommend purchasing one for both convenience and to maximise the impact of your surprise delivery.